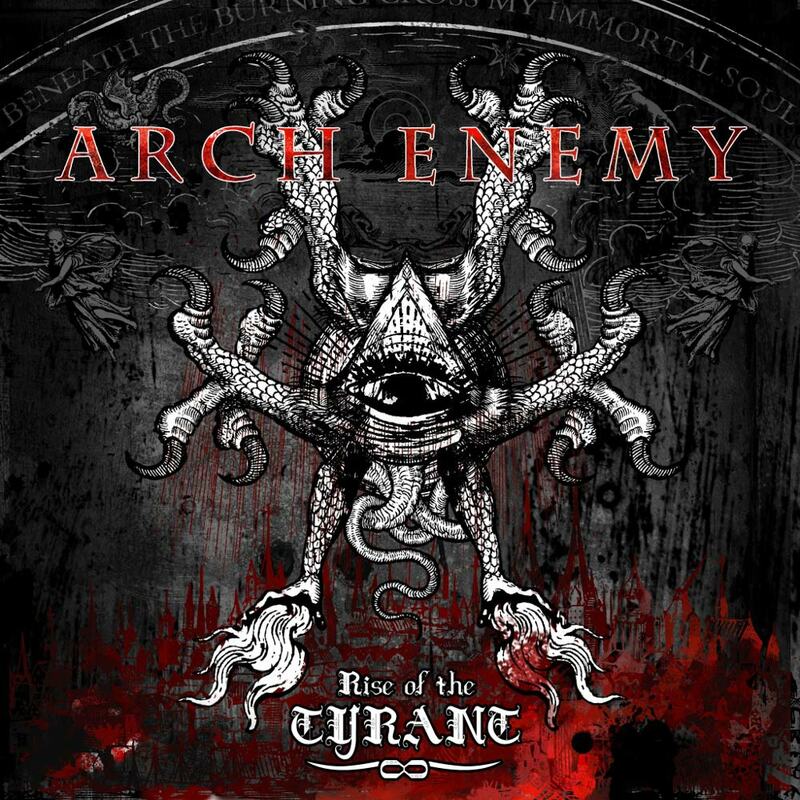 After the success, but also the controversy, aroused by "Doomsday Machine", Arch Enemy, the often maligned, often praised swedish melodic death metal ensemble led by Amott brothers, comes up with its seventh full-length release, named "Rise of the Tyrant". Will this album uphold the band's growing reputation in the metal community, or will it just give rise to critics by detractors? Well, "Rise of the Tyrant" shows little progression from the band's previous outputs, since the entry into scene of vocalist Angela Gossow. The songs are heavy, the riffs are thrashy and extremely technical (think to album opener "Blood On Your Hands", if you want an example"), there's plenty of awesome guitar shredding. Our blonde pet still growls and screams about rebelling against society, inner conflicts, pain, life struggles, etc. ; the vocals are of course still overlayered, although less effected than in the band's previous album. The drumming is fast and aggressive, featuring some interesting patterns and fills; the bass is unfortunately lost in the mix. The production is well balanced (save for the aforementioned bass volume) and sounds fresh, managing to result modern while not sounding too polished or lifeless. "Rise of the Tyrant" is overall a really strong, enjoyable and solid effort; the only problem is, it's nothing we haven't heard before from the band. The main issue with Arch Enemy is that they stuck to the same, commercially successful formula since the arrival of Angela; although the band's discography remained consistent (at least, until this point), the feeling you might get after listening to this album more and more might be that of tiredness, fatigue. This doesn't mean the album isn't cool: simply, it's pretty much the same kind of stuff we've heard before. The songs are overall strong, especially under the guitar department, featuring some top-notch riffing and some awesome guitar soloing, but they lack a bit of variety; they're almost all pretty much the same kind of track. The lyrical themes aren't particularly original or noteworthy, as stated above: they just fit the band's style. The guitar melodies, on the other hand, are definitely memorable and instantly recognizable, and they get fixed in the mind easily; this is an important requirement, since we're talking of a melodic death metal band. Furthermore, the choruses result particularly catchy and inspired. Album highlights include the aforementioned "Blood On Your Hands" (those riffs are really epic), leading single "Revolution Begins" (the melody and the chorus here are really noteworthy), the heavy title track "Rise of the Tyrant", and the final song "Vultures", the longest of the entire album.